First of all, apologies about the completely battered box of wax strips! They’ve been pulled out of the drawer so many times that the box has taken a bit of a beating! So, the first thing you need to get are the wax strips and this is Tip Number 1 really as you want to save the most money that you can! Companies like Veet sell wax strips particularly for your underarms, they are cut into tiny little arm pit sized strips to make the whole process easier for you. However, the price difference between these and regular strips is ridiculous! A pack of 20 standard sized Veet wax strips can be bought for around £4.50 from ASDA but a pack of 16 small, specifically cut strips is £6.99! The best way to get the most value for money is to buy the standard strips that are recommended for legs and cut them into strips yourself, that’s where the scissors come in! You get way more strips and you can cut them to the size of the area you want so there is no wastage! Tip Number 2 – You have to let the hair grow. I’m not talking like ridiculous lengths, but it needs to be enough for the wax to grip on to. Around 5mm is about right, I know this sounds gross but it is honestly worth it, just wear a cardigan for a couple of days! Tip Number 3 – Look at the direction the hair is growing! You have to stick the wax strip down and press the way that the hair is growing. Once it is stuck down you have to pull in the opposite direction to ensure the maximum amount of hair is removed. If you try and stick it down in the opposite direction or pull it off in the same direction, you are wasting your time and the money you spent on wax strips. It just won’t work! Tip Number 4 – You may need to do a couple of strips per arm pit. This is because the hair grows in different directions so you may need one for hair growing downwards, one for hair growing upwards and one for the weird ones that grow to the side. Tip Number 5 – There will just be some stubborn hairs that you cannot get! This even happens at the Salon. They choose to tweezer them out and if you have time, that’s the best thing to do. However, who really has time to tweezer their arm pits?! So I just use any old razor to get rid of any tiny hairs that are still there at the end. Tip Number 6 – How to get rid of the sticky residue left behind. Without a doubt, you will be left with sticky armpits, I’m pretty sure Veet sell specific wipes but, we’re trying to save money right? The fastest way to get rid of the wax is to use an oil based makeup remover. Don’t use anything expensive, just the cheapest one you have lying around and apply it to a cotton pad and sweep it over the area. The wax just disappears instantly! This also works if you’ve rested the strips against anything and need to get the wax off your floor/table/sink etc. 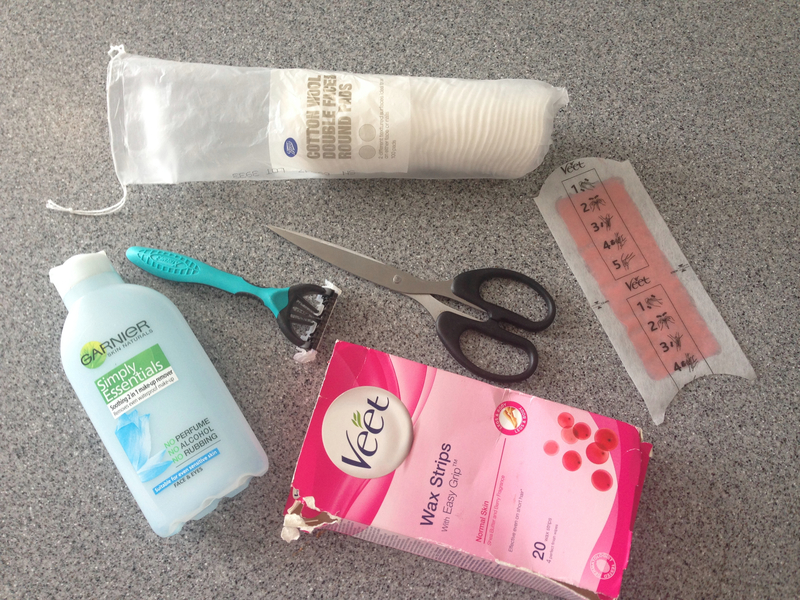 I hope this has helped any of you that want to give at home waxing a try! These tips will also work on legs, bikini line etc too. For your sake and mine, I have not included any pictures of my underarms, however, I can say that they are very smooth after this! Again, apologies if this isn’t too everyones taste, however, I want my blog to be about honest beauty tips and sometimes that involves a bit of a TMI post! My New Favourite Eye Combination?! Some great tips here especially with the different sized strips. Amazing tips! I’ve been waxing my own armpits (NOT TMI at ALL) for years. I switched from using wax to sugaring years ago and never looked back! Sugaring is way easier to clean up since it water soluble so any residue on your skin or the bathroom, can easily be wiped up with warm water. It’s also cheaper because the muslin strips are reusable! Haha I just find the tweezering takes longer than the actual waxing! I do find the whole process strangely satisfying and not really that painful at all. Maybe I’m weird too! I don’t think that it is tmi at all. 🙂 When I tried home waxing, I got a little bruise where each hair was. It wasn’t pretty, haha! And my skin reacts badly to the waxes – I’ve tried several over the years, and every time my poor sensitive skin goes crazy.